The Semi-Autonomous State of Jubbaland. 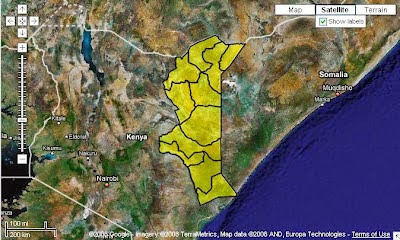 The Jubbaland initiative was advanced, promoted and marketed to the Kenyan government by Kenyan Ogadenis (a Somali clan mainly concentrated in Garissa county) who wanted to create an Ogadeni semi-autonomous state in Somalia that would not be entirely dependable on the Hawiye-dominated TFG (Transitional Federal Government, the then internationally-recognized UN-backed government) in Mogadishu. The Hawiye are the Somali clan that have dominated Mogadishu, and in extension the political life of post-Said Barre Somalia. 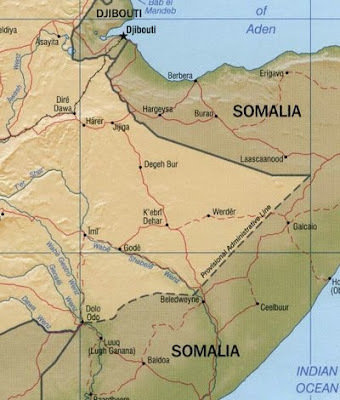 The Ethiopians, apprehensive and fearful that the Jubbaland policies being pursued by Kenya would stir an Ogadeni insurrection in its own Ogadeni-dominated Somali Regional State, opted to create the Jubba Valley Alliance (dominated by Somalis of the Marehan clan) to act as a counterweight to the KDF-allied Ras Kamboni Brigades/Movement (which serves as the military arm of the State of Jubbaland). Map Showing Somali-Dominated Region of Ethiopia. Photo Credit: Wikipedia. The Somali National Government (SNG) is quite distrustful and wary of Ahmed Mohamed Islam (popularly known as Sheikh Madobe) and who now serves as the President of the internationally unrecognized Jubbaland State. SNG views Madobe as an opportunist who traded his Islamist ideals for a secular creed in order to fragment Somalia into a collection of Clan-based autonomous states. Meanwhile, al-Shabaab used Kenya’s entanglement into Somalia’s toxic clan politics to portray itself as a non-clan-based equal opportunity Islamist organization that could restore order and tranquillity in Somalia as well as avenge the wrongs perpetrated against Muslims in Kenya. This was an important scorecard for al-Shabaab, especially among Somalis fatigued by the incessant and ever-destructive clan wars which have devastated their lives as well as ruining their future. Using this scorecard, al-Shabaab has been able to recruit fighters from within Jubbaland as well as buy the allegiances of several clans and sub-clans in the region. This fact combined with al-Shabaab’s military superiority over the Ras Kamboni Movement have enabled the jihadists to maintain operational military bases in Gedo region from where they have planned and launched terrorist attacks inside Kenya. Understanding Kenya’s history of persistent ethnic animosities, lingering grievances, corruption and skewed economics compounded by the sheer incompetence of its ethnically-based governments; al Shabaab was able to present itself to its potential Kenyan recruits as a just, non-tribal Islamist organization that could improve their future prospects as well as right the wrongs done unto them by the successive Kenyan governments. This way, al-Shabaab was able to recruit thousands of Kenyan Muslims into its ranks; and presently, Kenyan jihadists maintain a strong presence within the hierarchy as well as the rank-and-file of al-Shabaab. Considerate of the tribal sensitivities in Kenya, al-Shabaab has been able to infiltrate non-Somali Kenyan Jihadists back into Kenya to conduct surveillance as well as perform intelligence activities - since they could evade the normal security profiling of Somalis thus improving the chances that their terror activities would stay unknown for long periods of time. Moreover, these Kenyan jihadists have been implicated in devastating terror attacks that have occurred in Kenya. Psychologically, al-Shabaab has used its Kenyan jihadists to depict itself as a transnational Islamist organization capable of recruiting and training non-Somalis to fight loyally for them. Likewise, al-shabaab has used its Kenyan jihadists to sow confusion and suspicion among Kenyans of different faiths thereby broadening the existing inter-religious in Kenya.